The amazingly talented crooner Michael Bublé has announced a baby Bublé is on the way with wife Luisana Lopilato. To two first met in 2008, but it was the song “Haven’t Met You Yet” that sealed the love deal. Bublé wrote the song with Lopilato in mind and she later starred in the music video for the song. By 2011, love was in the air and the couple tied the knot. Bublé and Lopilato didn’t let new married life get in the way of living the charitable life they want to lead. Instead of hopping on an airplane to some faraway locale, the two flew to Africa where they volunteered with children. Bublé is not the only working parent in the family. Wife Luisana is an Argentine actress and model for the intimates brand Ultimo. She’s still under contract with the company, though no reports have leaked as to what will happen with the contract and her modeling career now that baby Bublé is on the way. The couple chose to release a video of a small portion of the ultrasound in order to announce the pregnancy. You can clearly hear the heart beat, which means Luisana could be nearing the end of her first trimester. Typically, Hollywood stars wait until the end of the first trimester/beginning of the second trimester to announce a pregnancy because the majority of miscarriages occur during the first 12 weeks of pregnancy. Luisana was not Bublé’s first love. The singer was engaged to Debbie Timuss, co-writer of the hit song “Home” until 2005. Bublé later dated actress Emily Blunt, but that relationship ended in 2008 just before Bublé met Lopilato. Lopilato, 12 years younger than Bublé, was not engaged or married prior to meeting their meeting in 2008. 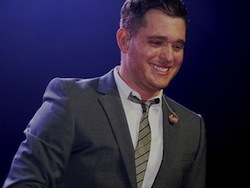 A due date for baby Bublé has not yet been announced by the couple or anyone close to the stars.